Paris Gare du Nord train station connects Paris to CDG Airport via RER B train line. 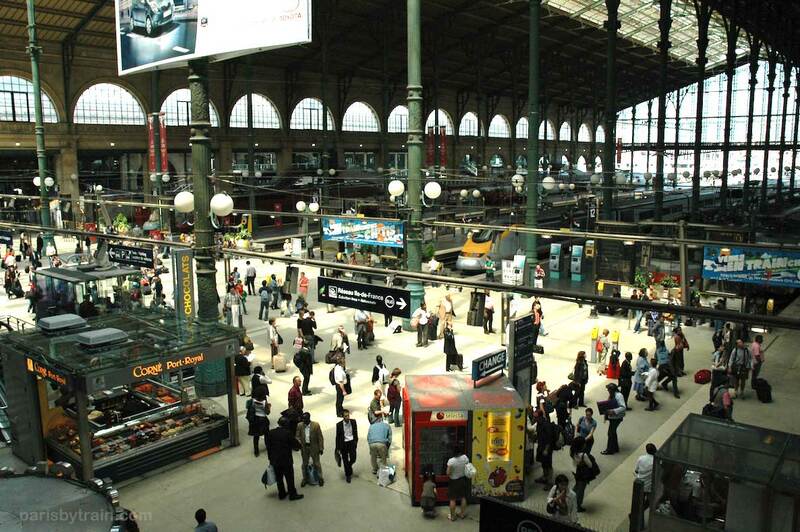 In addition Gare du Nord has TGV, Thalys, ICE, Ter, Transilien trains connecting Paris to London, cities in northern France (Lille, Calais, Dunkerque) Brussels, Amsterdam, Cologne, Berlin and many more. Here’s a panoramic photo of the western half of Gare du Nord showing the main train lines connecting Gare du Nord to other cities around Europe. 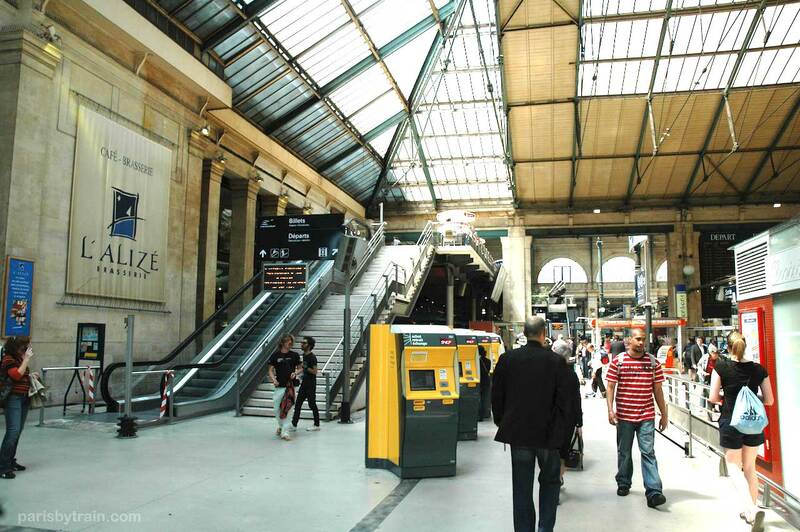 Above is a photo of the entrance to the Eurostar platform within Gare du Nord station in Paris, located up the stairs/escalators on Level 1 (Niveau 1). The Eurostar platform and trains are separated from other trains due to the need to screen passenger passports for the voyage to London. (The UK is not a Schengen zone country). Climbing the stairs in the last photo we arrive at the Eurostar check-in level. Visible on the left are e-ticket machines where one can collect Eurostar tickets purchased online at Eurostar.com. 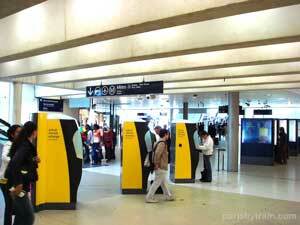 The Eurostar ticket office (not visible) is located just left of the ticket machines. If you don’t have a smart-chip pin protected credit card, these machines which will most likely not work for you. Instead, enter the ticket office and collect the tickets in-person. Have a print-out of your ticket confirmation email (with the ticket reference number) plus a passport to retrieve your tickets in-person. At the end of this walkway is the Eurostar entrance. Non-EU citizens will need to fill out a declaration card for UK Immigration before you enter. Cards are available near the blue information kiosk visible in the centre of this photo. 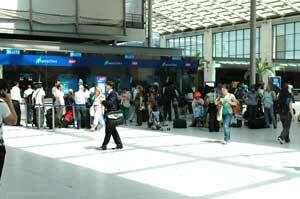 The above photo is the scene at Gare du Nord upon arrival from the London to Paris Eurostar train. 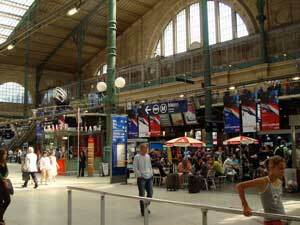 This is facing south east towards the front entrance of Gare du Nord on rue de Dunkerque. 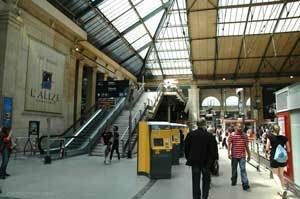 Just to the right of this area, in front of train lane #3 are stairs and escalators down to Baggage/Luggage Storage inside Gare du Nord. Centre middle is an overhead blue sign pointing left towards the Metro and RER trains located two levels down from street level (picture here). There will be two sets of stairs leading one level down just left of this scene. 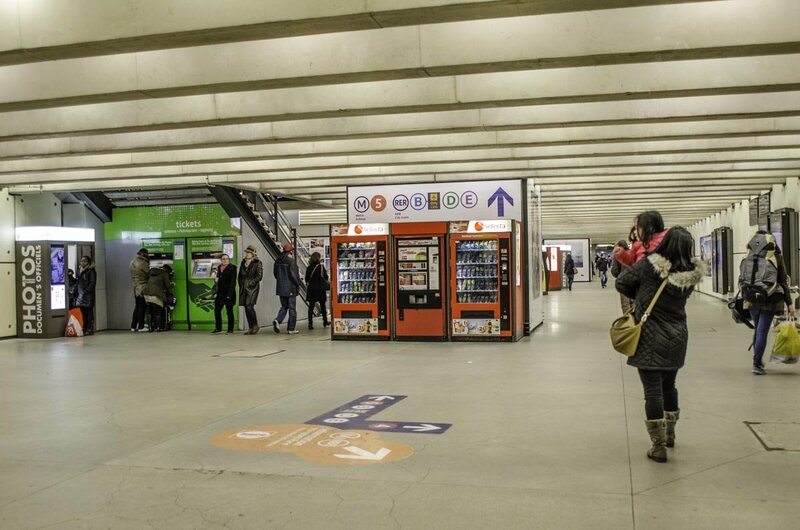 At the bottom of the first set of stairs will be two green Billetterie Ile-de-France ticket vending machines where you can buy Metro, RER and Transilien commuter train tickets. 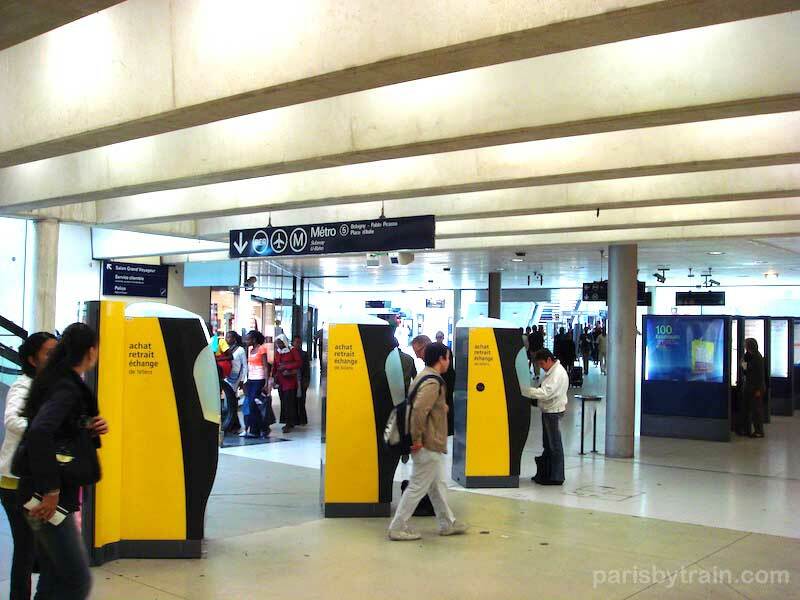 Continuing further down the hall you’ll see plenty of yellow TGV ticket machines where one can collect, change, cancel their Grandes Lignes tickets (TGV, Ter, etc.). 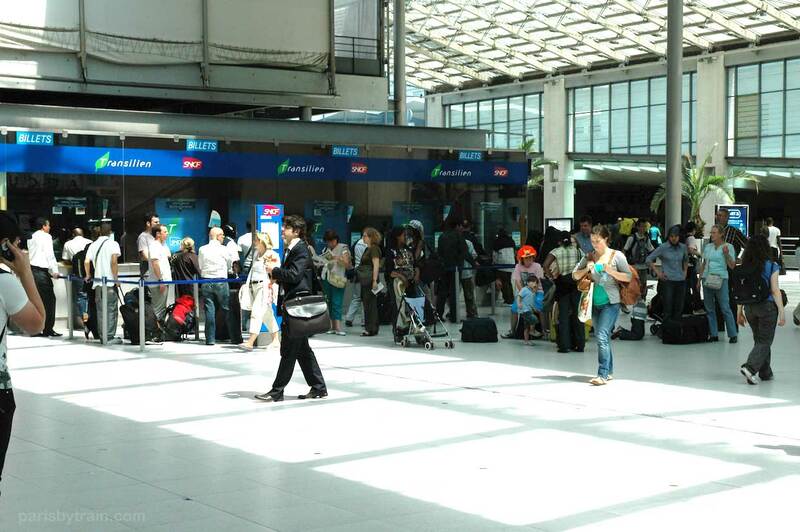 Visible is another overhead sign pointing towards Metro and RER trains with an airport symbol signifying the RER B train service from Paris to CDG Airport as well as Orly Airport to the south. Here’s another photo of the same hall, opposite side. In the distance you can see several green Billetterie Ile-de-France green ticket vending machines. These sell both RER and Metro tickets trains (Billet Ile-de-France, Paris Metro Ticket t+) including carnets and can recharge Pass Navigo / Découverte with Carte Orange (although they do not sell new cards). Continuing down this hall leads towards Metro lines 4 & 5 and RER B, D, and E.
The above is a photo of the western half of Gare du Nord station from the Eurostar level overlooking train lanes/platforms 1-13 (voie in French) for Eurostar and Thalys trains arriving from London (Londres), Brussels (Bruxelles) and German cities. 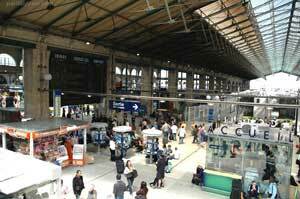 Near the center of the photo is a sign reading Reseau Ile-de-France RER with an arrow pointing to the east side of Gare du Nord station. This is the direction of the RER B, RER D, RER E platforms underneath Gare du Nord, at sublevel 2. 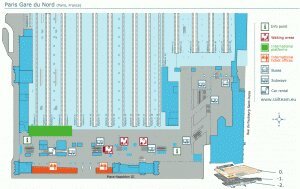 Near the middle of the photo below of Gare du Nord main train lines atrium you can see a blue rectangular sign reading “Metro” with RER and Metro symbols. 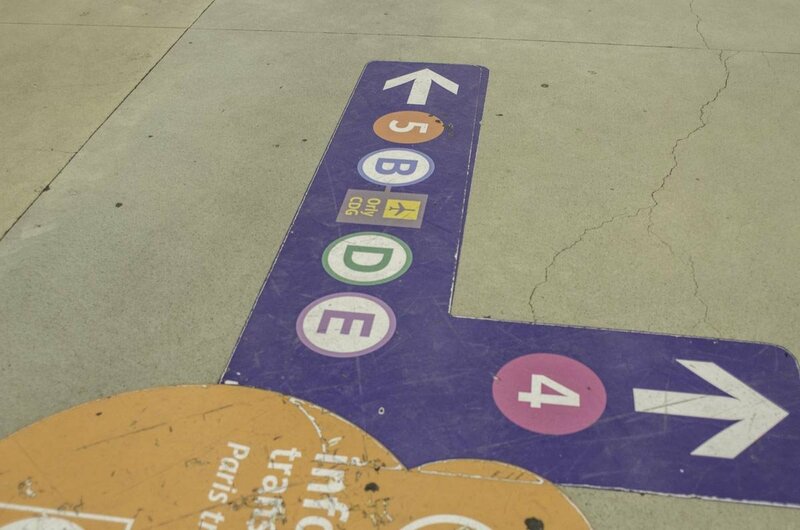 Follow those signs to get to the RER B, D and E train lines as well as Metro 4, 5. 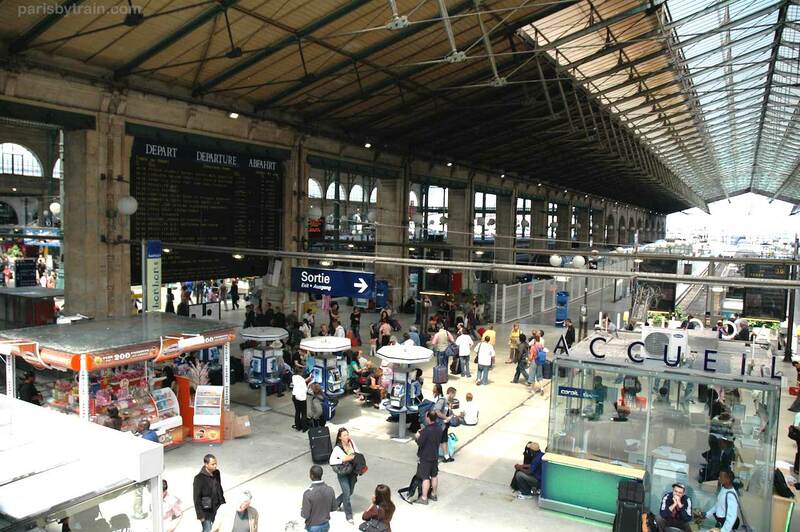 Photo of the eastern half of the Gare du Nord station facing north, showing the departures board on the left, train lanes (voies) 14 and up, used for TGV trains and Ter (Ile-de-France) trains. At bottom right is an information booth with an ACCUEIL (Welcome) sign along the top. Beyond the Departures Board, on the other side, are more train lanes for Thalys (high speed trains from Paris to Brussels, Belgium, to the Netherlands and Germany) and Eurostar (high speed trains from Paris to London). 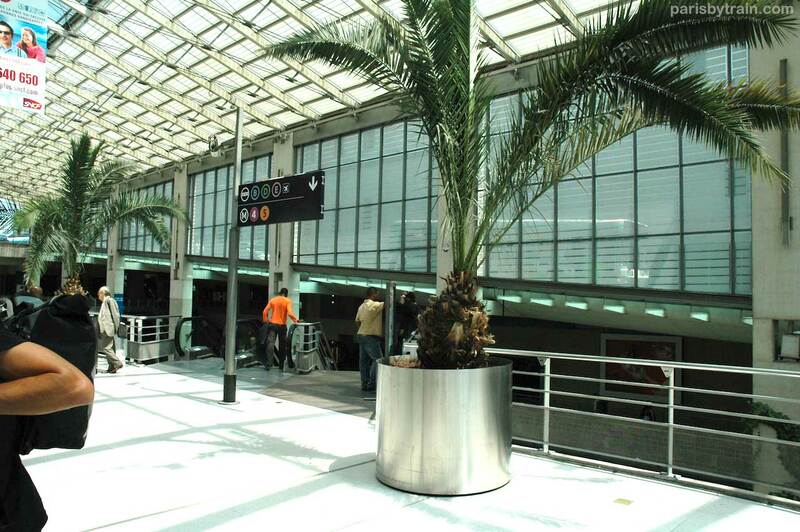 East (looking right) of this position is the large open atrium leading to the RER B, D, E lines and Metro line 4 and 5 on sublevels 2 and 1. 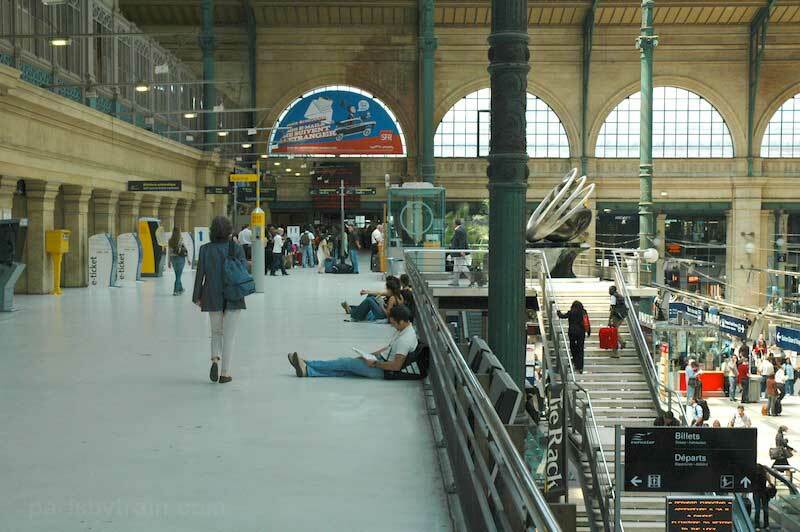 This is a photo of the eastern atrium at Gare du Nord with a Transilien (Ile-de-France) ticket window selling tickets for Ter and Transilien trains traveling outside of Paris, but within the Ile-de-France. Further east (looking right) is the RER/Metro portion of Gare du Nord. Photo from just above and west of the RER/Metro lines at Gare du Nord along the Eastern edge of the station. 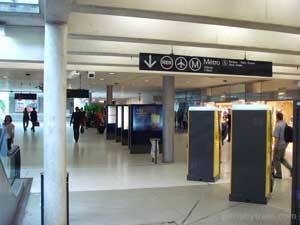 Here you can see a sign for RER lines B, D, and E plus Metro lines 4 and 5. 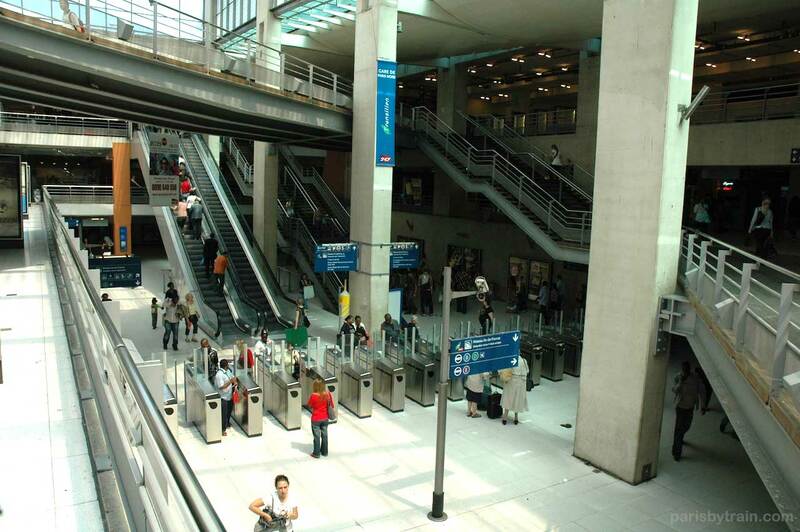 Photo of Gare du Nord’s RER/Metro station entrance section, full of turnstiles, leading to train platforms serving RER B, RER D and RER E and Metro Line 4 and Metro Line 5. RER B trains connect Paris to Aeroport Charles de Gaulle (CDG), taking roughly 25 minutes from Gare du Nord. RER B also connects central Paris/Gare du Nord to Paris-Orly Airport to the south requiring a train change at Antony Station with the final connecting train being Orlyval which stops at both Orly West (Ouest) and Orly South (Sud) terminals. RER D runs north-south, connecting Gare du Nord to Gare de Lyon station in direction of Melun or Malesherbes. RER E runs east-west connecting Gare du Nord to Gare St-Lazare on the western side of central Paris. 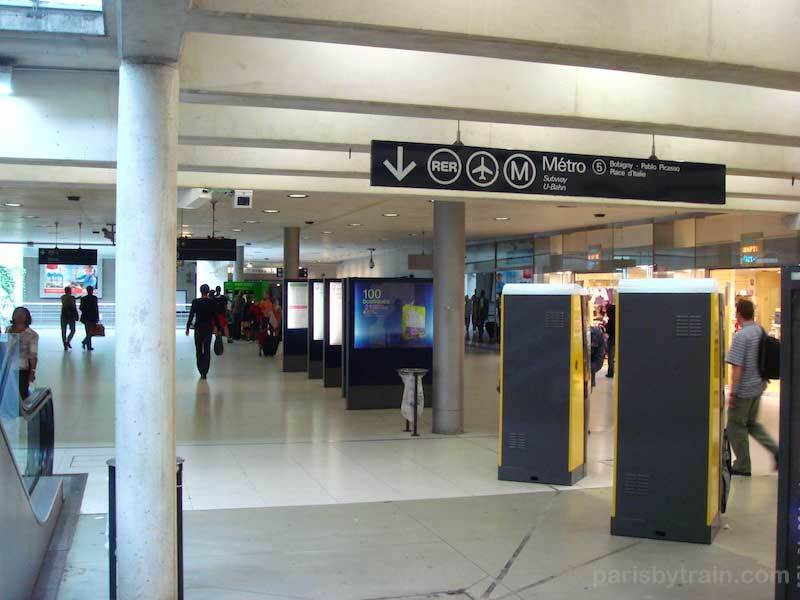 A photo of ticket vending machines at Gare du Nord within the RER/Metro section of the station. 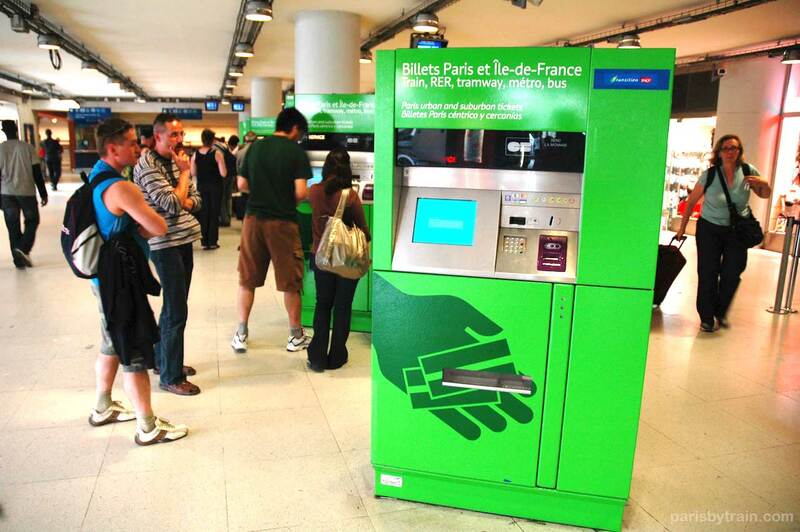 These machines are used for buying individual Metro/RER/Bus/tramway tickets (Ticket t+), carnets (books of ten or twenty Ticket t), and also tickets for train destinations within Ile-de-France on Transilien or Ter trains. 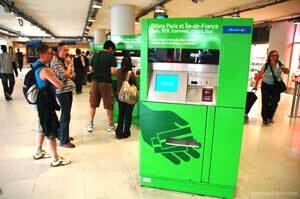 Remember that most non-smart-chip credit cards will not work with these machines, so use Euro coins if you have them. 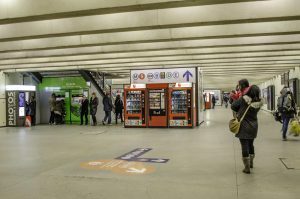 These machines can also charge up Pass Navigo / Navigo Découverte cards with Carte Orange week or month “subscriptions” (abonnements) using the Navigo slot. 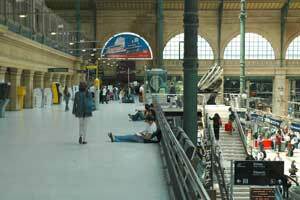 Read about staying safe in Gare du Nord train station. Simple Gare du Nord map showing the main train platforms (“Grandes Lignes”).